mundane jane: Serendipitous, that's what that is. Serendipitous, that's what that is. I was just sitting here, wishing I had a story to tell that made someone else look silly, and just about thiiisss far from giving into the temptation to make up lies and falsehoods against people who love, respect, and trust me. 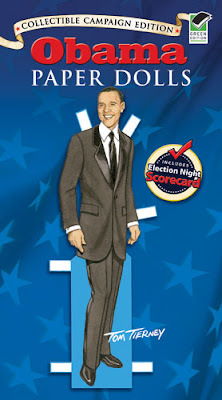 Suddenly, out of the blue and into my inbox, I get an email notifying me that the new Obama Paper Dolls are ready! These, my friend, beat the tired old stuffing out of a boring, everybody-has-one campaign yard sign! And you may have mad spray-painting skills, but you can't make a sign big and ugly enough to be cooler than these. No way. I'm torn between wanting to get them for everyone I know or buying a set just for me--I sort of want to be the only person in the world who has them. These collectible paper doll sets feature realistically rendered paper dolls of Senator John McCain and Senator Barack Obama, their wives, plus casual and formal outfits they wore during the campaign. 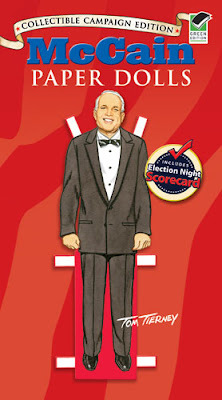 Each paper doll set includes a brief biography, descriptive notes, and a bonus Election Night Scorecard. Oh alright, already. Buy yours here.